On February 14th, 2017, BINUS UNIVERSITY held an orientation program in BINUS Square to welcome the exchange students for spring 2017. More than 80 students were coming from 31 different universities and 13 countries, with Korea and Netherlands become the biggest contributor for incoming students this year. The event was started with introduction about BINUS UNIVERSITY. After that, following basic academic information, Ms. Laily Alfa Citra as Manager of International Office, explained to the students about visa, gave tips how to adapt to life in Jakarta and shared the knowledge about Jakarta. 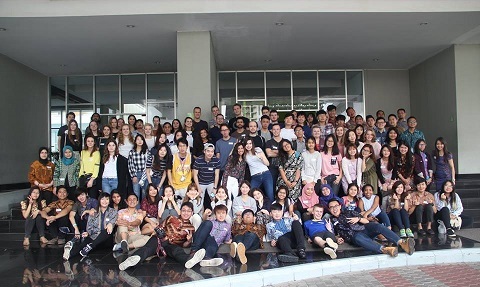 After taking group photos and having lunch together, the session continued with detail information for their living in BINUS Square, begin with facilities like swimming pool, laundry, shuttle bus, up to the regulation of the dormitory. They also got more information about Teach for Indonesia, an organization which provides tutoring, disaster relief and other community development initiatives; the existence and availability of Language Center for foreigners to study Indonesian language; and way to get the opportunity to experience internship in Indonesia through the program of BINUS Global, parent division of International Office.